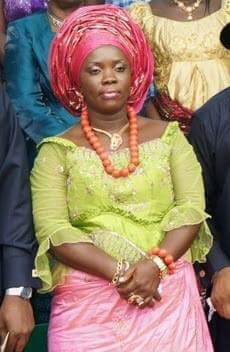 The Bayelsa State First Lady, Dr. (Mrs) Rachael Seriake Dickson has substantially encouraged early child birth and marriage with the promise of paying any girl-child who gets pregnant in the state to henceforth receive monthly stipends. Our Bayelsa State Correspondent reports that Mrs. Dickson stated this at the official flag-off ceremony of a 3-day workshop of the Niger Delta Royal Queens Peace Building Summit (NDQPBS) organized by the Bayelsa State Traditional Rulers Wife's Association in Yenagoa, the Bayelsa State capital. According to her, "If you have a niece or a cousin, sister or a friend who is pregnant, please call them for us, we want to see them, we will even pay them for being pregnant for us", she added. Mrs. Dickson, who champions a cause through her pet project, Konyefa foundation, for girl child education and empowerment of women to enable them contribute their quota through education, advised the girl child to abstain from abortion. She, therefore urged Queens of the region to take good advantage of their positions as mothers of all, to better the lives of women in the society through advocacy campaigns which will focus on girl child education. Shortly after the event, the Chairperson of National Association of Women Journalists (NAWOJ) Bayelsa State chapter, Mrs. Maria Olodi Osumah and the Press Secretary to Her Excellency, Mrs. Joyce Ogiowo began the gaging of Journalists, threatening to deal decisively with anyone who reports the events as it unfolded. NAWOJ Chairperson said, "we own the practice of journalism in Bayelsa State and as such dictates the activities of every Journalist in our area." The atmosphere amongst Journalists at the event was brought to an halt when some journaliss who cautioned the NAWOJ Chairperson of her wrong doings and countered her claims, saying, "Journalists are free to disseminate information in accordance with the constitutional provision of the law of federal republic of Nigeria". Earlier, the Chairman of Bayelsa State Traditional Rulers Council and former military administrator of old Rivers State, King Alfred Papapreye Diete-Spiff in his welcome address said, Royal Mother's must be part of the equation of nation building by engaging the youths, noting that there is no Royal Mother who is not a mother of a kingdom. In her keynote address, the Chairperson of Association and convener of the program, Her Royal Majesty (HRM) Josephine Diete-Spif, said the essence of the program was to enlighten Queens of different kingdoms and clans to educate children and women and create awareness campaign to address some of the teething challenges that affecting their subjects in the region. The program with the theme: An Enlightened Queen is a Enlightened Community, Josephine Diete-Spif emphasized the need to discuss, learn and empower women to enable them impart positively to the traditional domains for the overall promotion of peace and economic prosperity. She said, "In my 24 years of being a Queen, i noticed that we are a rallying point and that is why this summit is anchored on "Peace Building" because it is not news that poverty and insecurity are major challenges facing Nigeria with our region having a share of it."